What is a mattress? Ok, duh right? But really – do you know the history of the mattress, and when they first started to be used? Rocky Mountain Mattress wanted to dive a little deeper into this for you and bring you some insightful info on the subject! Enjoy! For centuries, human beings have depended on mattresses. We have used mattresses to sleep on and, in some circumstances, as padding. What exactly is a mattress? Where did it come from? Who invented the mattress? Find out all of your mattress questions here. What is a mattress? Webster’s Dictionary defines a mattress as “a fabric case filled with resilient material (as cotton, hair, feathers, foam rubber, or an arrangement of coiled springs) used either alone as a bed or on a bedstead.” It can also be “an inflatable airtight sack for use as a mattress.” Our current definition of mattress comes from the Middle English materas. Mattress also comes from Anglo-French and Medieval Latin materacium. In Arabic, mattress is derived from matrah, which means the place where something is thrown. 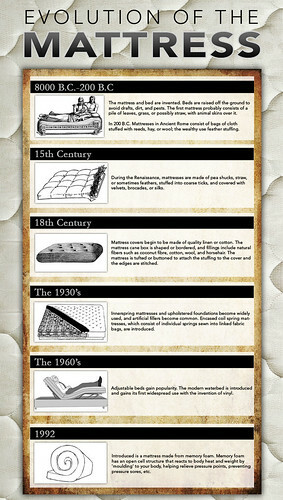 As you can see, mattresses have been around for quite some time. When did mattresses first start being used? There are different theories about which civilization actually “invented” the mattress. Europeans adopted the Arabic method of sleeping on cushions during the Crusades. Traditionally, these cushions would be thrown on the floor in some sort of pattern to create a larger pad to sleep on. Most sources say that mattresses started being used during the Neolithic period. People in this period of time began sleeping on raised platforms to avoid dirt, pests and drafts. Mattresses were probably first made from leaves, grass or possibly straw, with animals skins over it. In 3600 B.C., Persians began using goat skins that were filled with water. The Ancient Romans slept on bags of cloth filled with reeds, hay or wool during 200 B.C. Wealthy Romans used feathers to stuff their mattresses. During the 16th and 17th centuries, mattresses began to evolve even further. People began making wooden frames to put their mattresses on. The frames would have a lattice work of rope or leather to support the down or straw-stuffed mattresses. Mattresses weren’t covered with cloth or linen until the mid 18th century. In 1855, Tyler Howe patented the first Spring Bed in Spencer, MA. Two years later, steel coils were patented for use in mattresses and chair cushions. The inner-spring mattress was invented by the Germany-born Heinrich Westphal. Sadly, he died in poverty after never profiting from his invention. Believe it or not, the first few Water Beds were sold via mail-order in 1895. The box-spring mattress was invented in the late 19th century. The box spring helped regular mattresses not feel so lumpy. Inner-spring mattresses became extremely popular in the 1930s. During the 1950s, foam rubber mattresses and pillows became available for general use. NASA invented memory foam in the 1970s but it wasn’t until 1992 that Tempur-Pedic introduced the first mattress made of it. Mattresses have come a long way from their origin in the Neolithic age. I know I’m sure grateful that I have a pillowtop inner-spring mattress to sleep on, rather than a pile of leaves. Mattresses now come in all different sizes and textures. The most popular types of mattresses today include: inner-spring, memory foam, latex, air, and waterbeds. Now you have a little bit of history behind you when you go to buy your next mattress. These days you can even have your own custom made mattress for the perfect sleeping experience!